The folks at Turner Sports had to be walking a little taller yesterday with the announcement that they had re-signed the entire Inside the NBA cast to new multi-year contracts. While the announcement may not come as a huge surprise given the chemistry and the success of the program and its participants, it is noteworthy because of the implications for its biggest star – Charles Barkley. In recent years, Barkley has been very vocal about ending his time as a television analyst for TNT sooner rather than later. Sir Charles has been at this for a long time and whether it’s a job in basketball, politics, or elsewhere, he’s made no secret of his hopes for a new challenge. So if TNT being able to re-sign Barkley is a victory on the network’s behalf, the news revealed by Turner President David Levy must be the equivalent of winning a championship. He said at the network’s upfront presentation to advertisers that Barkley and the rest of the Inside the NBA team had been re-signed for “8-10 years” and lined up with the network’s new NBA rights deal, which runs until the 2024-2025 season. 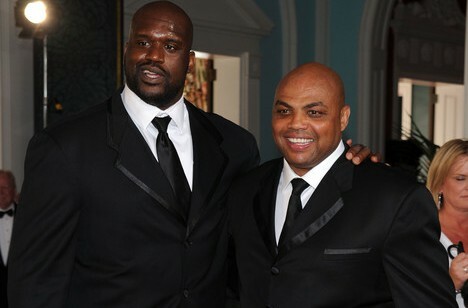 Turner said during its “upfront” presentation to advertisers Wednesday at The Theater at Madison Square Garden that it has signed the entire cast – Barkley, Ernie Johnson, Kenny Smith and Shaquille O’Neal – to multi-year contract extensions. Later in the day, Turner Broadcasting president David Levy said the extensions run eight-to-10 years and are designed to line up with the new NBA rights contract that runs through 2024-25. Barkley said he reconsidered retiring from the show in part because he never got the chance to be a general manager that he long has sought, and also to keep from breaking up a successful television team. “They wanted to keep the band together,” he said after the upfront, which was hosted by the “Inside the NBA” crew, whose three appearances on stage were the highlights of a show that also featured the company’s entertainment and news programming. The long-term contract also has implications for other sports as well with Ernie Johnson then sticking around (one would presume) for Turner’s MLB Postseason coverage. And then there’s the NCAA Tournament, where the Inside the NBA crew will continue to have a major presence. Inside the NBA has been the torchbearer for the sports studio show for well over a decade now and it’s great for Turner Sports and NBA fans to know that it will keep going for another decade as well. Pingback: Charles Barkley: Steph Curry is "not more than a shooter," "not a great playmaker"